Basant Panchami or Vasant Panchami marks the beginning of the spring season. The day is also celebrated as Saraswati Puja and the goddess of wisdom and knowledge, Saraswati, is worshipped on this day. Basant Panchami, Saraswati Puja: Image shared by Congress President Rahul Gandhi on Twitter. New Delhi: President Ram Nath Kovind, Prime Minister Narendra Modi, Congress President Rahul Gandhi and other political leaders on Monday greeted the nation on Basant Panchami and Saraswati Puja. West Bengal, in particular, celebrates the day with great joy as the day is part of Bengal's culture. With elections just around the corner, West Bengal has become politically important for the BJP. Party's state leaders have asked the local party leaders in different parts of the state to associate themselves with or organise community Saraswati Puja at various places. On Monday, President Ram Nath Kovind said in a tweet, "Greetings to all fellow citizens... May this festival, which celebrates learning, spur us to expand the frontiers of education and knowledge in our families, our society and our country." Prime Minister Narendra Modi prayed for a happier society on the auspicious occasion. "Greetings on BasantPanchami. I pray that this auspicious occasion makes our society...even more harmonious. May the blessings of Maa Saraswati always remain with us and bestow us with wisdom," he tweeted on the occasion of Basant Panchami and Saraswati Puja. 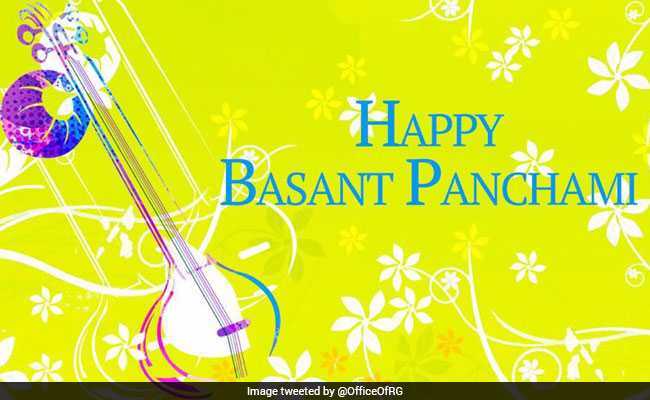 Congress President Rahul Gandhi greeted the nation with "Happy Basant Panchami to all" in a tweet. Many other politicians also took to the micro-blogging site and greeted the nation. Union Home Minister Rajnath Singh said, "Warm greetings to you on the occasion ofBasant Panchmi. May Maa Saraswati blesses everyone with knowledge and wisdom. I pray for a safer, peaceful and prosperous India on this auspicious occasion." Warm greetings to you on the occasion of Basant Panchmi. May Maa Saraswati blesses everyone with knowledge and wisdom. I pray for a safer, peaceful and prosperous India on this auspicious occasion. Union Minister for Law and Justice Ravi Shankar Prasad tweeted, "May the Goddess Saraswati bless you with knowledge and wisdom..."
Minister of Food Processing Industries Harsimrat Kaur Badal tweeted, "With spring in the air and fresh blooms in the fields, may the festival of Basant Panchami bring vigour and vitality in your life. Wish you all a happy #BasantPanchami"
Basant Panchami or Vasant Panchami marks the beginning of the spring season - Basant means spring and Panchami means "the fifth day". On this day, Hindus visit temples and pray to Goddess Saraswati, who is the goddess of knowledge and wisdom, and celebrate the day as Saraswati Puja. Devotees also take holy dip at Triveni Sangam in Uttar Pradesh's Allahabad.